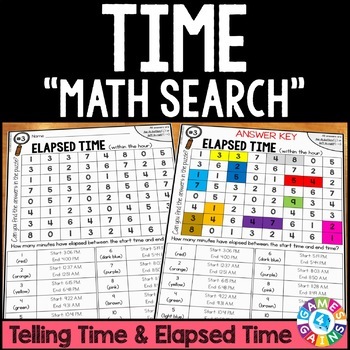 If your kids love word searches, then they'll certainly love these math searches! 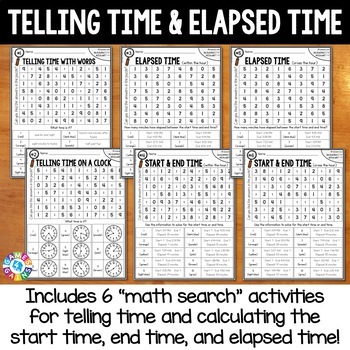 This 3rd Grade Elapsed Time and Telling Time Math Searches Pack gets students excited about practicing their time skills! 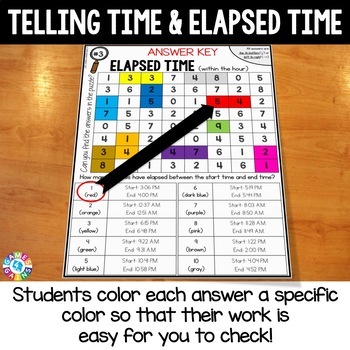 In this pack, students will tell time to the minute and calculate start time, end time, or elapsed within 60 minutes (within the hour and cross the hour). To use, students have to solve each problem and then locate and color the answers within the math search grid. Each problem is assigned a specific color so that the answers are easy for you to check! Want to learn more? Check out the preview file above! 3rd Grade Measurement & Data Games Pack - BEST SELLER! We love to hear what you think! Please leave your feedback on this resource to earn credit points to save money on future purchases! Click on the green ★ above to follow my store to get notifications of new resources, sales, and freebies! Created by Brittney Field, © Games 4 Gains, LLC. This purchase is for single classroom use only. Sharing this resource with multiple teachers, an entire school, or an entire school system is strictly forbidden. Multiple licenses are available at a discount.